Digital asset management is a broad area of management for media ‘assets’ that are in digital form and includes ( though not completely! ) the process of ingest, cataloguing, storage and retrieval. Though storage is just a part of the process, it is definitely not an easy task to be accomplished effectively and in an organized way. For all photographers, backing up of images is extremely vital to protect the assets that were created by them. I have worked writing programs before in DAM domain and I definitely understand how a media company effectively uses computer servers to automate the entire process. Its a multi-million dollar industry. At my level, as a photographer, I prefer to talk in brief on challenge at a much smaller scale that I faced recently w.r.t storage. How does it feel when you loose another external storage drive just before you go on a long trip? And, how does it feel, as a photographer, when 2 of your backup hard disk drives subsequently fail in the middle of a long trip? 3 hard drive crashes in a span of one month really took me to the heights of not trusting in present day strorage technology. I underwent this trauma very recently. As a computer engineer by degree, I felt really embarassed to accept this fact when we talk so much about technology, its uses and reliability. At the end of the day, I had to just accept the reality as is and move on with life. To add salt to injury, data recovery support is really poor in India be it with Seagate or Western Digital or Maxtor or any other major players in storage technologies. Third party data recovery agents exploit this lack of ‘official support’ from the hard drive manufacturers and charge humongous amounts of money for data recovery that makes the situation even worse. I am sure many of you would have faced a similar issue at some point in your life. With drooping shoulders, we at many times let go of the ‘vital data’ that we all need fearing the high costs charged for data recovery process. Sounds really insane and I hate this. With this post, if anyone from Seagate by any chance is reading this, I would strongly urge you to provide a data recovery support in major cities of India!! Glad that I had redundant backup of my so called ‘assets’ but this incidence provoked me to analyse my current disaster in depth and make some corrective actions and better strategies. Through this post, for all people who wish to go serious on digital photography and asset management, I would like to urge you *not to* procrastinate your backup activity ! If you do not have multiple copies of your images, please do make it now! Make a strategy for backup. Different people follow different backup strategies and methodologies and through this post I would like to throw some light on the most common and easiest strategy that I have come across. This can be efficiently implemented by any amateur/beginner photographer who wishes to go professional ( I hate this word!) way. Many of the photographers might already be following a similar methods already, but for the uninitiated, I feel this post would serve as a pointer in their learning curve. 1. At the end of each day, review and transfer all your ‘keeper’ images to 2 backup devices ( can be 2 carry-on external hard drives or 2 copies on DVDs or combination of both), on field. Discard what is not needed. Be critical of your keeper images to avoid dumping garbage! 2. At the end of the trip, transfer all the on-field backed up images on to one of your enternal hard drive that is in your studio/home. Do not discard the images from the drives that were copied as a part of step 1 until your next trip happens. This helps in having multiple copies incase of emergencies / surprises! Remember you can never predict when a hard drive fail is bound to happen. 3. Have a secondary backup hard drive and synchronize the images onto this from the primary ( first backup) hard drive. 4. I would also suggest you to have a third copy of backup of images on another external hard drive. Make sure you do not keep this at your home/studio. Keep it in a trustworthy, secret location. This is necessary for ‘disaster recovery’. In case of fire or theft, you still have all your RAW files with you ! 5. For the sake of convenience and identifying your drives, you can color code the drives and assign a name to it. c. Red – Tertiary back up used as a disaster recovery plan. 6. Back up to primary and secondary drives can happen once you have your new set of images ready for backup. For backing up on tertiary drive you can have sync time of 6 months to 1 year or depending on your need. 1. Make sure you buy new set of hard drives atleast once every 2-3 years. Storage gets cheaper by day and technology keeps changing. If you rely on DVD, you need to back all your images when a new technology like blue-Ray disc becomes a most commonly used optical media. 2. Do not move your external hard drive when it is switched on. 3. Avoid dropping hard drives. Prevent them from shocks. Always wrap them in anti-static covers to keep them safe. Remember, if you are a serious photographer, the content you have with you is just not limited to be called as your asset, but all your images are your investments resulted from personal sacrifices! 4. More you spin the disk, less reliable it becomes over time. This doesn’t mean you should completely stop using the disks. Do it at a relatively lesser frequencies than the other two. This is slightly grey area and only the hard drive manufacturers can provide the right answers. Some even say that, not spinning the disks can make it unusable! 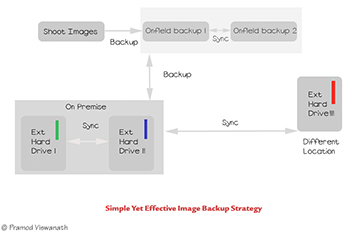 Note: This strategy can be further simplified when one chooses to use RAID or NAS, but what I have told here is a simple and cost effect way of backing up images. Hope I have some useful tips for backing up of digital images. 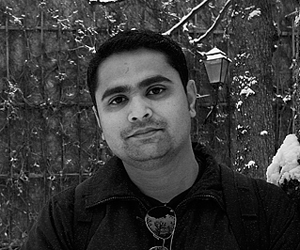 Very useful post, Pramod, and a very insightful suggestion of the backup model. As you very rightly said, procrastination is the biggest bugbear of photographers, and I too have learned the importance of taking backing up very seriously of late. I have two copies of my pictures now, one on smaller, 160/250GB drives and another on a 1TB WD, which is not connected to the computer all the time, to prevent it from voltage fluctuations and wear due to use. Whenever I need access to the images, I use the smaller hard disks which are always connected. In addition to this, I plan to burn the select best images from each trip/shoot on DVDs as a tertiary backup as you suggested. I also do not delete the images of one shoot from the camera storage until the next, just in case there have been some unseen errors in the copying process. I strongly urge everyone who reads this to take Pramod’s suggestions seriously and not leave this important task until it’s too late. Santosh, it’s nice to see similar strategies being adopted by you as well. Many times we learn from our past mistakes but it would be too late by then :). BTW, 3500 INR is just the minimum cost, I have heard that it goes upto 35,000 INR. In the event of a hard-disk crash where you don’t have a backup, recovery is indeed an arduous and expensive task, like you rightly mentioned. When my 160GB hard disk crashed earlier this year, I didn’t have any backup of the precious pictures in it (I hadn’t bought the 1TB yet) and a couple of vendors I approached quoted exorbitant charges (as high as Rs. 3500!) Luckily, I decided to give Sandisk’s Rescue Pro recovery software a shot before coughing up the money. I wasn’t even sure that it would work on large storage disks but amazingly, it worked! Of course it was a long and slow process, with the recovery of the complete data taking as many as around 6 hours, but nevertheless, I managed to recover almost 100% of the files. Therefore I strongly recommend the software, but one obviously wouldn’t want to let this happen in the first place, by ensuring that adequate redundancy measures are taken beforehand. Just a query which just came across my mind. It might sound funny! You have mentioned about tertiary storage for disaster recovery. Is there any locker facility to keep such storage in a safe area? That’s a good question. “Secret Location” can refer to many things. One of the place could be a bank locker – you are right. Very informative article. From now on I will be using above backup strategy. I just recovered my lost pics (which were not backed-up anywhere else) and i realized how important pics is to me and how unreliable technology is.I have already purchase a additional 500gb hdd for backup and planning buy one more on thanks giving day. I prefer DVDs to external harddrives for my backups. I just consider the amount of moving parts in a storage medium while selecting it. The lifespan of a harddrive nowadays is around 4 years. Dvds last much long as a secondary backup. Thanks Sunith letting me know your thoughts. I have had bad experiences with DVD as well. Relatively CDs are much better!